The Inland Revenue Department (IRD) on Friday felicitated 15 companies and an individual for being the largest taxpayers in the fiscal year 2016-17. 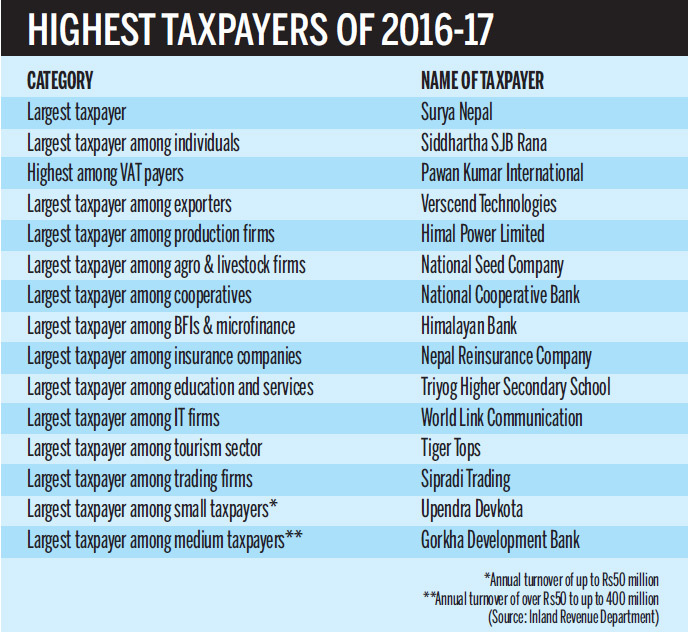 Surya Nepal paid the highest amount of tax among companies while Siddhartha SJB Rana topped the list among individuals. They were honoured amid a programme organised to commemorate the sixth National Tax Day. Surya Nepal manufactures varied products ranging from cigarettes, safety matches and incense sticks to readymade garments. Rana, the executive chairman of Sipradi Trading, has been recognized as the largest taxpayer for the fourth time in the last six years. Likewise, Pawan Kumar International has been honoured for paying the largest amount of value added tax (VAT). Verscend Technologies paid the largest amount of income tax among exporters. Himal Power came first among production businesses, and National Seed Company was honoured as the largest taxpayer in the agriculture and livestock industries. Similarly, National Cooperative Bank was honoured in the cooperative sector while Himalayan Bank has been named as the largest taxpayer in the banking and financial institutions and microfinance segment. Gorkha Development Bank paid the largest amount of tax in the medium enterprise segment with an annual turnover of Rs50-400 million. Nepal Reinsurance Company, Triyog Higher Secondary School, World Link Communication, Tiger Tops and Sipradi Trading topped the list in their respective sectors. Renowned neurosurgeon Upendra Devkota was honoured among small taxpayers with an annual turnover of up to Rs50 million. Addressing the National Tax Day function, Chief Secretary Lok Darshan Regmi said taxation had assumed greater importance as the government has aimed to upgrade Nepal to developing country status from the existing underdeveloped country status by 2022, and attain the goal of becoming a middle-income country by 2030. He stressed the need for effective mobilisation of the country’s resources to meet these targets. Achieving the Sustainable Development Goals 2016-30 is a challenge, and the government needs to enhance the tax administration for effective revenue collection, said Regmi. Kishor Jung Karki, director general of the IRD, said that the department had started devising a simplified tax collection mechanism to suit the country’s federal structure. Revenue collection in the country has been satisfactory. During the last fiscal year, collection exceeded the target by Rs45.97 billion and reached Rs611.76 billion. This is the result of an improved taxation system and expanded revenue base, Karki said. The government has set a target to collect Rs730.05 billion in revenues this fiscal year. KATHMANDU: The IRD launched the central billing monitoring system on Friday with Sipradi Trading becoming the first company to implement it.